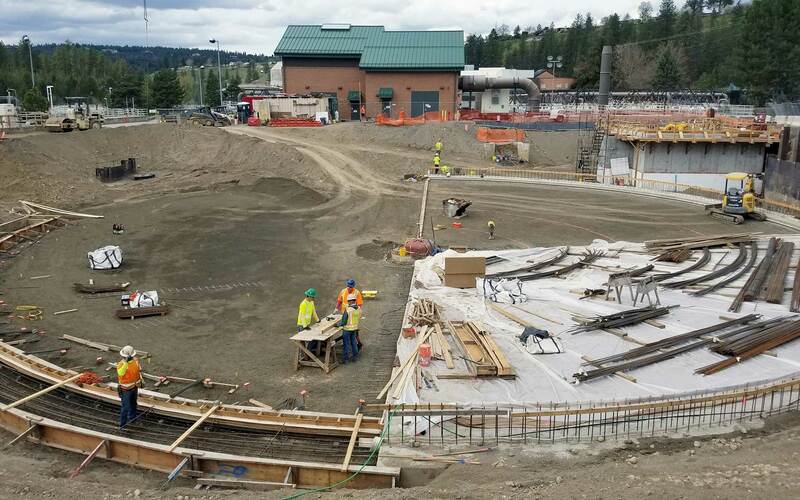 The City of Spokane is working on a major upgrade to its Riverside Park Water Reclamation Facility. 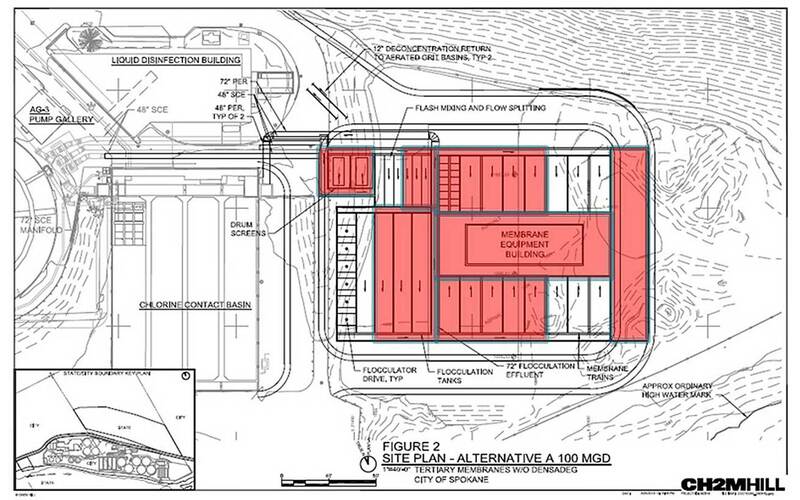 The upgrade will add a new filtration system at the plant, commonly called the Next Level of Treatment, and will greatly improve the quality of effluent that is released to the Spokane River. The upgrade will increase the removal of phosphorus from the effluent to more than 99 percent, from 90 percent today. Phosphorus has been associated with low oxygen levels and algae blooms in Lake Spokane that can harm aquatic life. The system also will remove greater amounts of heavy metals, PCBs, and other pollutants. The system, which will be located on the southeast end of the plant, will use advanced membrane filtration technology to provide the pollution reduction benefits. It will be designed to treat an average wastewater flow of 50 million gallons a day. Construction on the project is under way and encompasses a number of different elements, including a new solids digester, a fifth primary clarifier, a new chemical building, and the membrane facility itself. The City is required to be in compliance with phosphorus standards for the plant's effluent by March 2021. Construction costs are expected to total about $126 million for the membrane system alone. Reduce overflows from combined sanitary and stormwater sewers. And upgrade the Water Reclamation Facility to remove more pollutants from the plant's effluent. The discharge permit for the plant requires the City to reduce the amount of phosphorus going into the river during a "critical" period from March through October. As part of the Integrated Plan, the City voluntarily expects to run the system year round because it makes sense for the health of the river. This project will be the largest upgrade at the plant since the 1970s; the City has operated the plant since the late 1950s. The City treats about 34 million gallons of wastewater every day at the plant. With the implementation of this system, the City will treat the wastewater to a “Class A” standard that would allow the water to be reused for irrigation, industrial processes, dust control, enhancing wetlands, and recharging groundwater supplies. The City is using an alternative process for delivering a public works project called the General Contractor/Construction Manager (GCCM) process. The City got approval to use the GCCM option from the state in the summer of 2015. With this approach, which is in lieu of the traditional design-bid-build process, the City selects a company to serve as the “GCCM” early in the process to assist with evaluating the design to help ensure its constructability. The Washington state law that allows this process suggests its use is appropriate for complex project at occupied facilities that must operate during construction. MWHC Constructors & Slayden Construction Group, a joint venture of Bellevue, Wash., is serving as the GCCM on this project. CH2M Hill is the project designer. Additionally, the City has selected a membrane technology for its facility, following a pilot of two different systems. Pall Microfiltration Systems was the selected vendor and its system includes membrane filters within enclosed canisters.